Last week a friend asked me if I could make a toddler scarf for her little niece, Amelia. 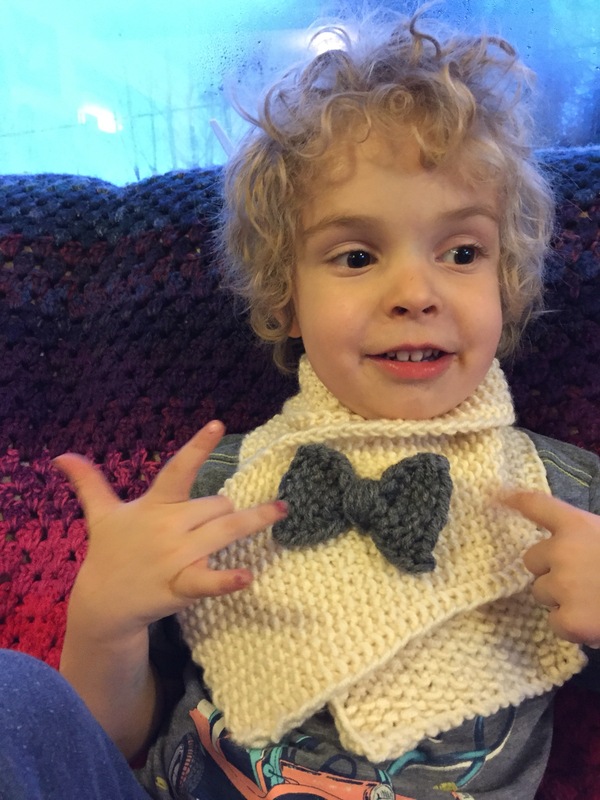 The idea of a toddler wearing a scarf is funny to me. I can’t imagine it staying on a wriggling little 2-year-old. But that got me thinking: why not make a scarf that will stay put? 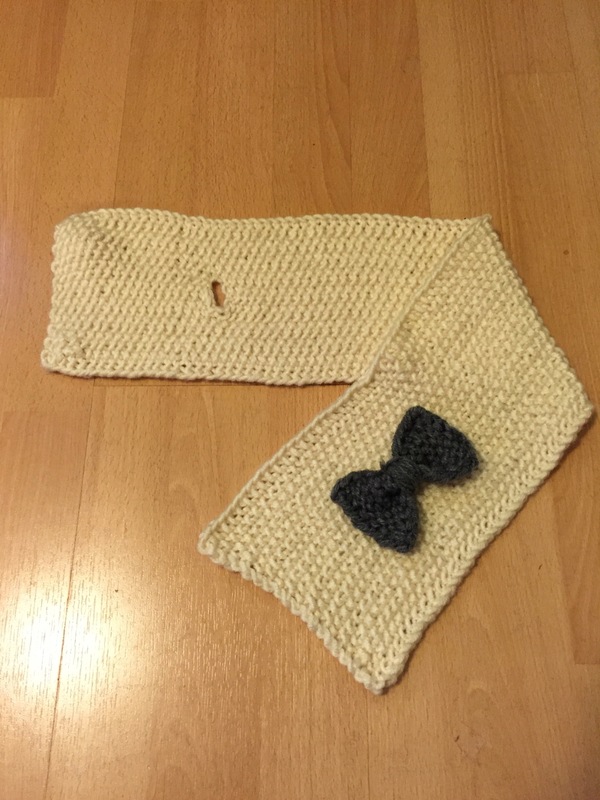 I searched Pinterest and came across the most adorable scarf pattern that uses a bow as a button. This was definitely the right idea. 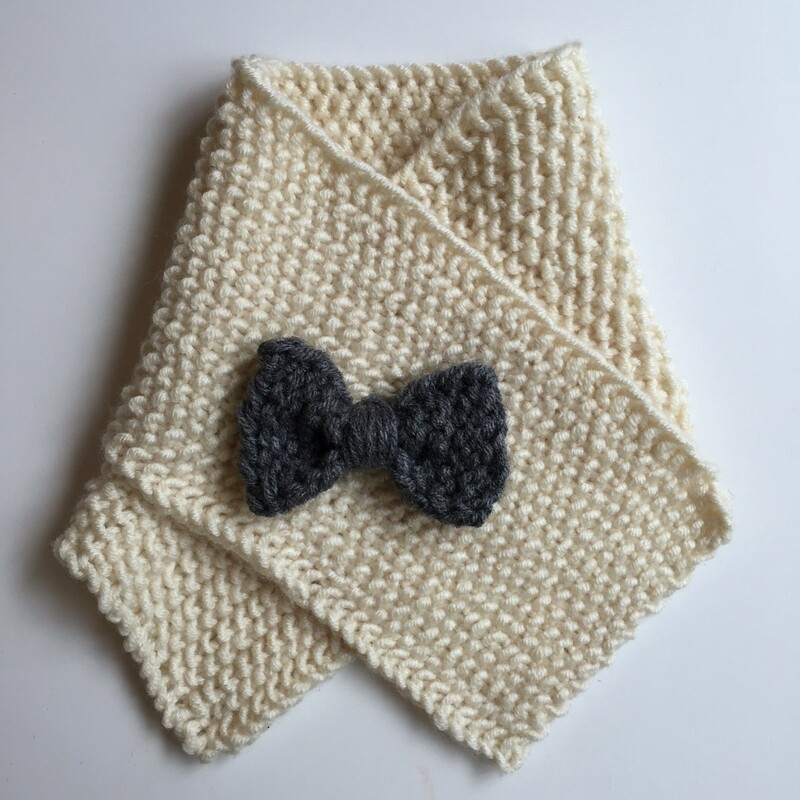 Create a buttonhole near the end of the scarf and secure a knit bow in the buttonhole. That should keep the scarf in place on a hippitty-hoppity hyper toddler. I love the look of seed stitch, a.k.a. moss stitch. It keeps the knit piece from curling on the edges and it looks attractive on both sides of the fabric. And it’s a little fancier than garter stitch. This is a simple weekend project that’s bound to keep your little lady cozy and warm. Essentially, you knit where there’s a purl and purl where there’s a knit on the previous row. Note: I slip the first stitch of each row, knitwise, and purl the last stitch of every row regardless of where I am in the seed stitch pattern. This creates a neat edge. It is not required and therefore I haven’t included it in the row-by-row instructions below. Seed stitch for 18 rows. Row 1: Slip 1 stitch, seed stitch for 9 stitches. With the left needle, pull one stitch over the other stitch, *knit one, pull the second stitch over the knit one; repeat from the * twice more. You have now cast off 4 stitches. Continue with the seed stitch for the rest of the row. You should have 8 stitches on either side of the cast-off stitches. 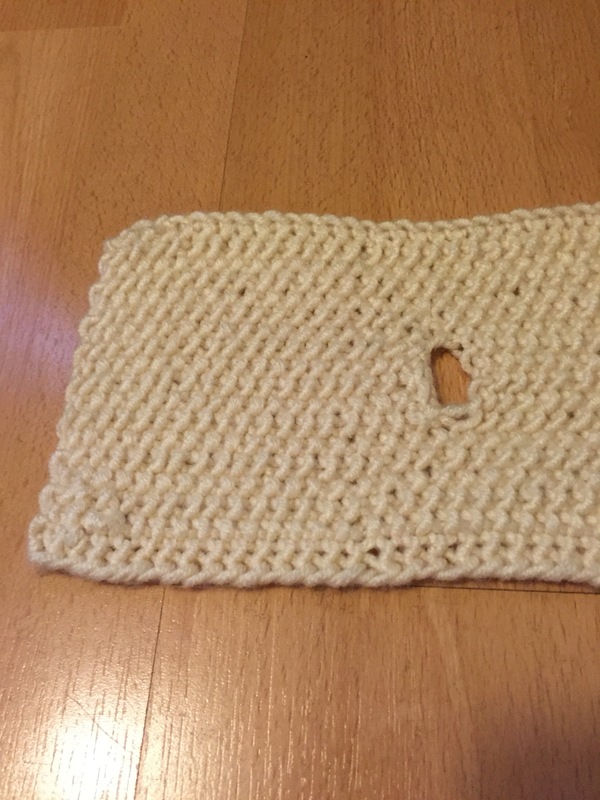 Row 2: Slip 1 stitch, seed stitch to button hole, cast on 4 stitches, continue the seed stitch for the rest of the row. – 20 stitches. Continue the seed stitch pattern until the whole piece measures 25 inches. Cast off and weave in ends. 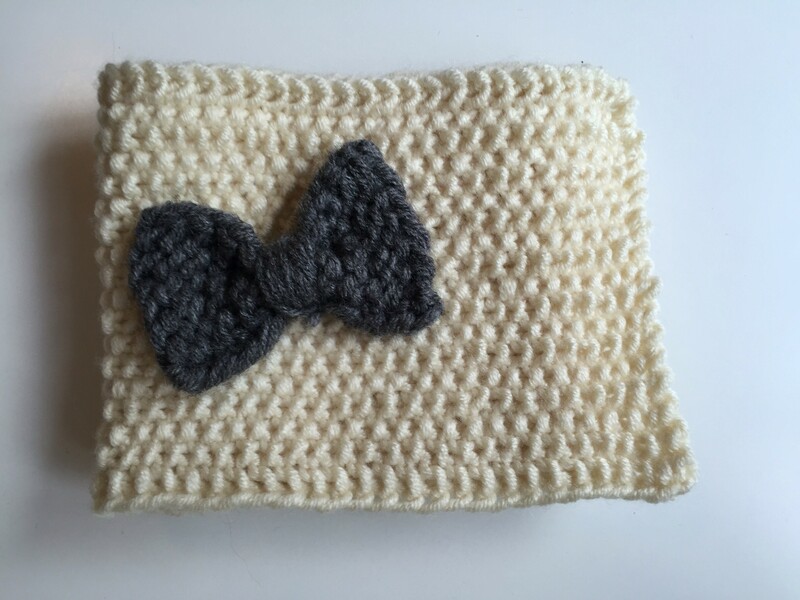 Bow: Cast on 10 stitches and knit in garter stitch for 10 rows. Cast off and weave in ends. 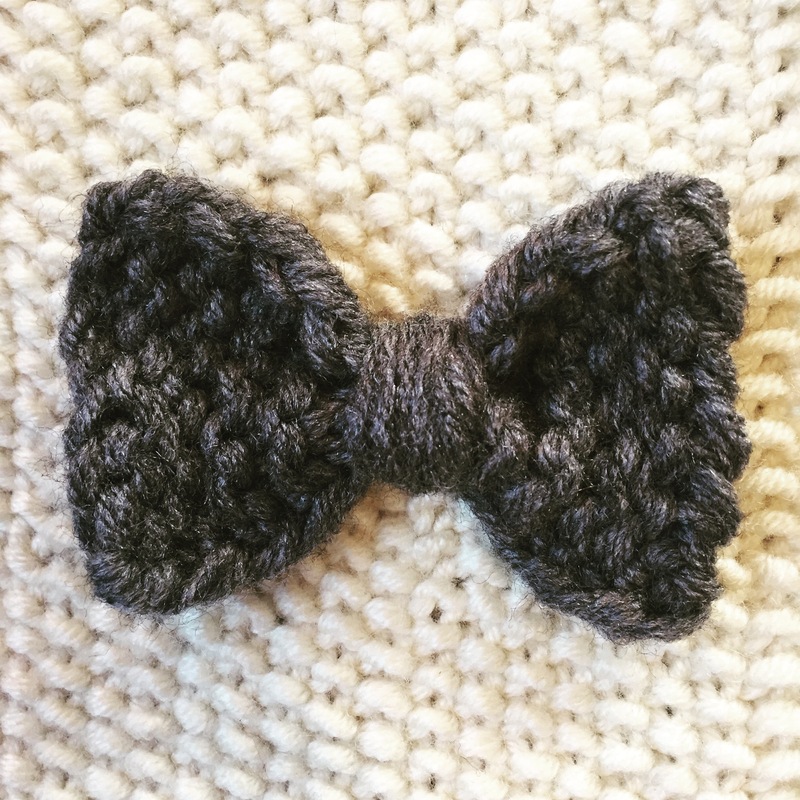 Wrap grey yarn around the middle of the strip several times and tie the ends in the back of the bow. Using the fisherman color yarn and darning needle, sew the bow to the end of the scarf opposite the button hole, the same height as the button hole (about 4 inches from the edge). I don’t have a little lady, so my little gent got to be the model. Kind of looks like a bow tie, right? The top can be folded down a bit like a collar to make it a little narrower and warmer. 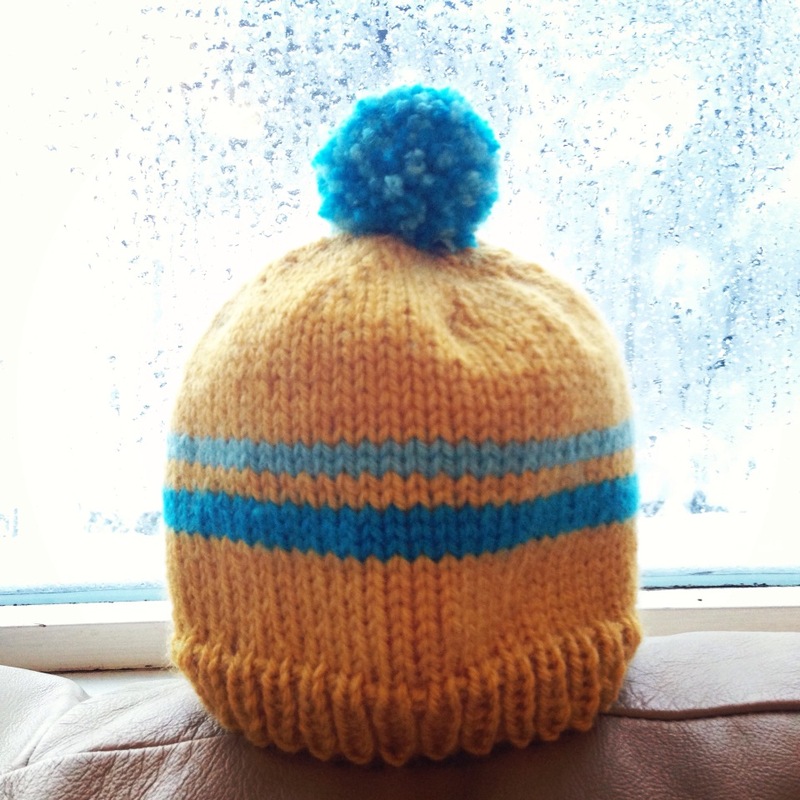 This morning I found a stack of hats I knitted for my son that he has worn from birth to present. It’s hard to believe he fit into that teeny green hat! The biggest, most worn hat is definitely too small so I decided it was time to make him a new one. Since Jack is 3 and has all the opinions in the world, I thought it would be fun to let him choose the colors for his hat. I opted for an ear flap hat to keep his body warm during recess. We had a really fun time together today picking colors as we went along. When I sent a photo to a friend she said, “It’s like a Choose Your Own Adventure hat!” We have a title, folks! It’s been a busy month here in Alaska blogland. Akshopgirl, Tessie Style, DJ Spencer Lee, The Sawbuck, Fernanda Conrad and I have been providing tips, costume ideas, music mixes, cocktails, decor projects and more for the Halloween season. This week is dedicated to all those procrastinators. We’ll be featuring last-minute Halloween ideas, but today I wanted to feature a costume that if you have a few hours to spare this week you could still pull off. 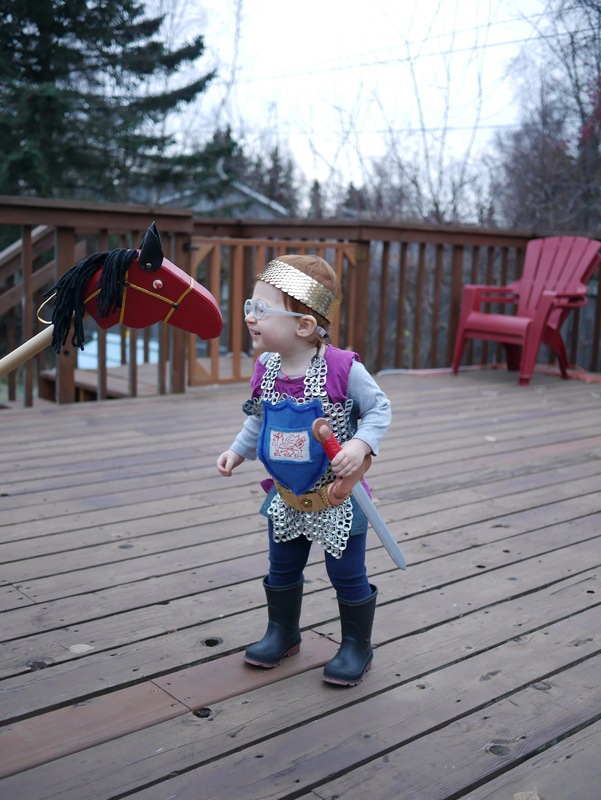 My friend Kait sent me photos of her daughter’s costume and it was too darn cute not to share. 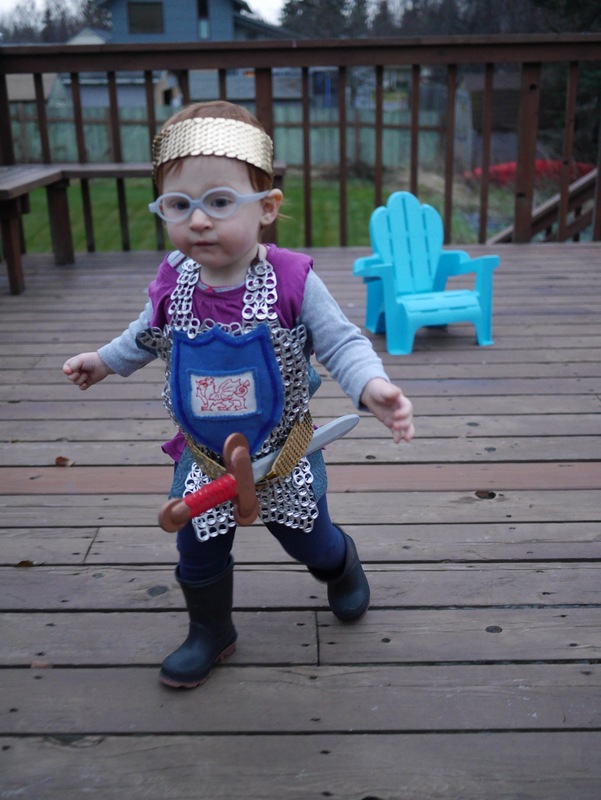 Little Bea’s armor is constructed out of soda pop tabs and jump rings. Kait said she used about 350 tabs. Construction wasn’t the hard part, she said. It was collecting the tabs themselves. Luckily she was able to find a friend with a whole bag of tabs. Kait used 10cm jump rings to connect the tabs, but if she were to do it again she said she would use 12 or 14cm instead so it would use fewer tabs and take less time to make. The dragon emblem was part of a handmade birthday card her husband received in the mail and the belt and crown are made from a belt purchased from a rummage sale. Bea’s costume doesn’t stop here. 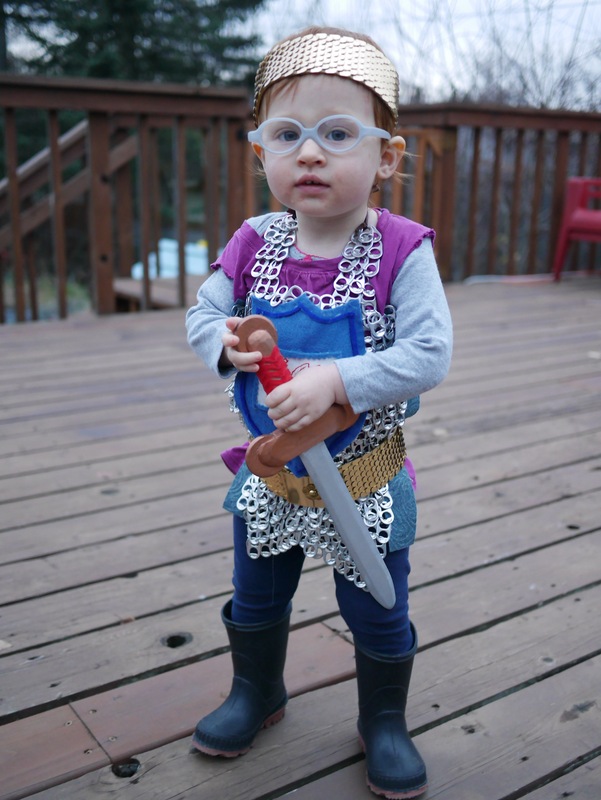 Bea’s father is going to be her damsel in distress and Kait will be dressed up as a dragon. Kait is already planning for next year. It’s week two of our Halloween Blog Party and the theme is “Woodland Creatures.” So far we’ve had fairy flower crown and forest garland tutorials, a woodland fairytale mix by DJ Spencer Lee and today I’ve got a super quick baby costume that requires minimal crafty skills and a shoestring budget. 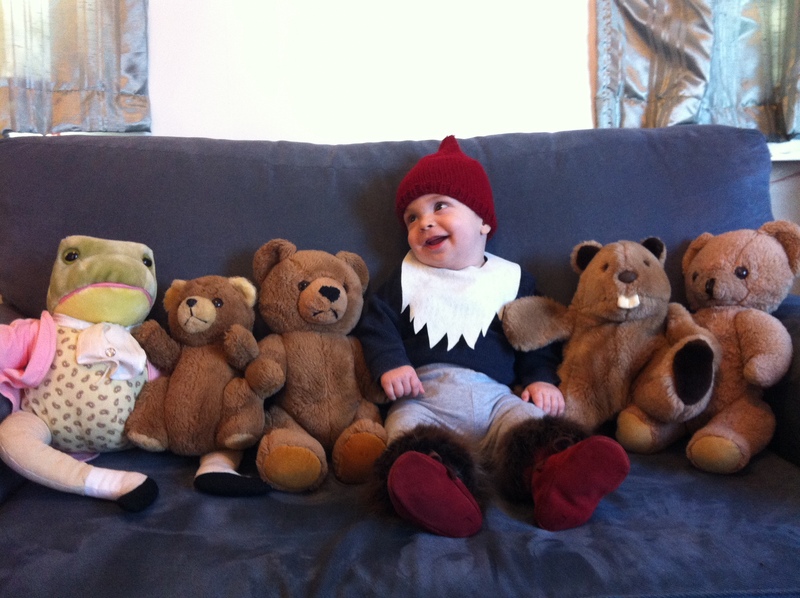 This was my son’s first Halloween costume and I love it so. 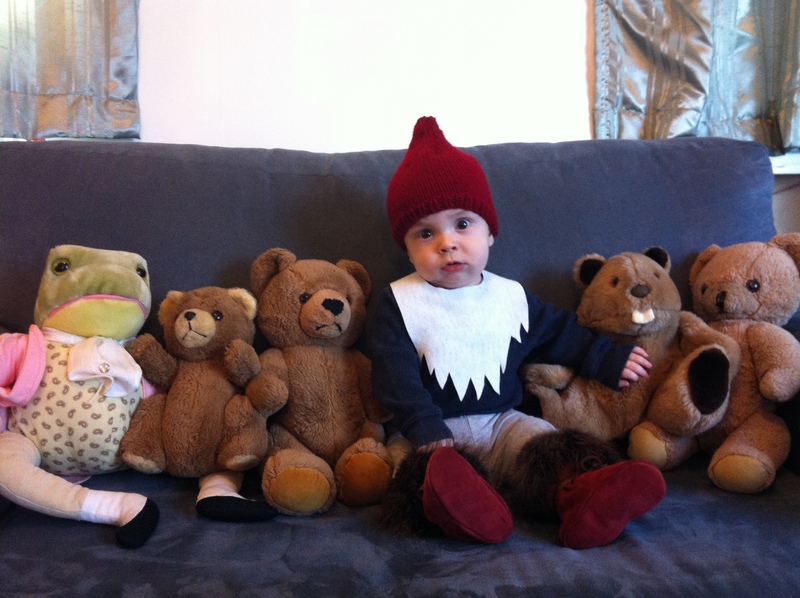 A while back AK Shopgirl was inspired by our little gnome. 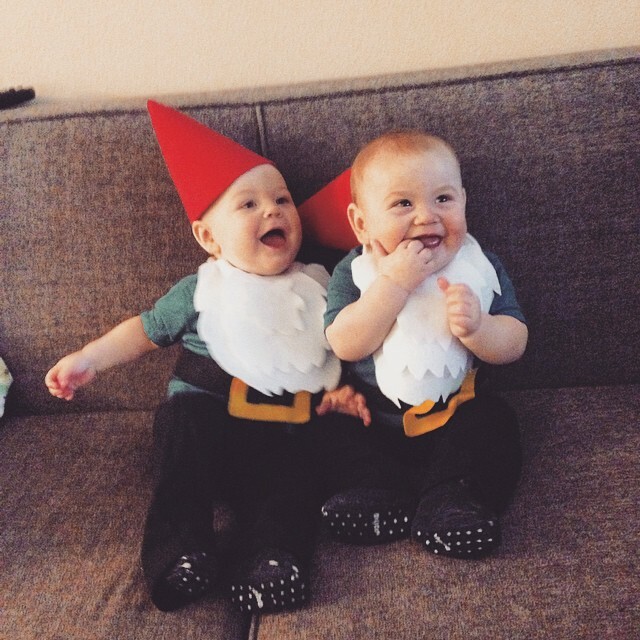 She decided to dress up her twin baby boys as more traditional David the Gnome. *If you aren’t a knitter, I suggest making a gnome hat the way AK Shopgirl did using a sheet of red craft foam fashioned into a cone, adhered with a hot glue gun. Ohhappyday.com has a free template here, if you want to get technical. 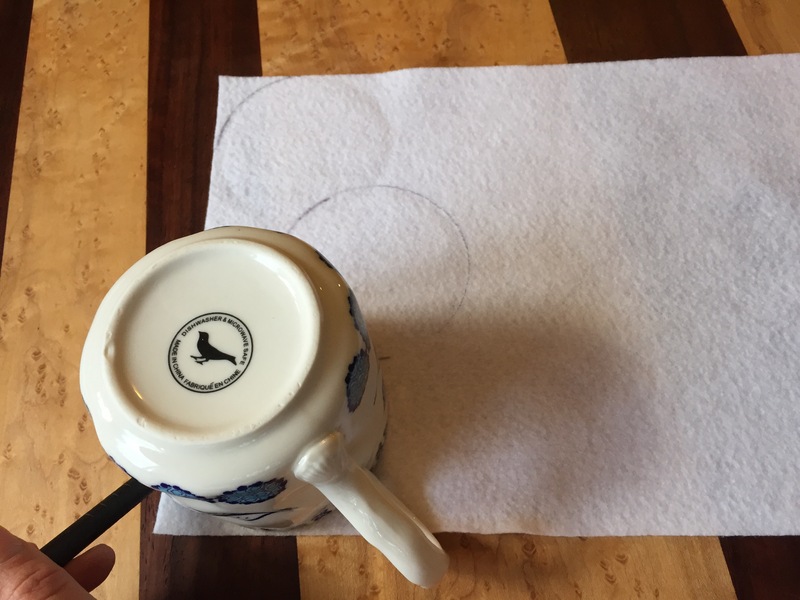 Place the mug upside down in the middle of the white felt, 1.5 inches down from the top edge. 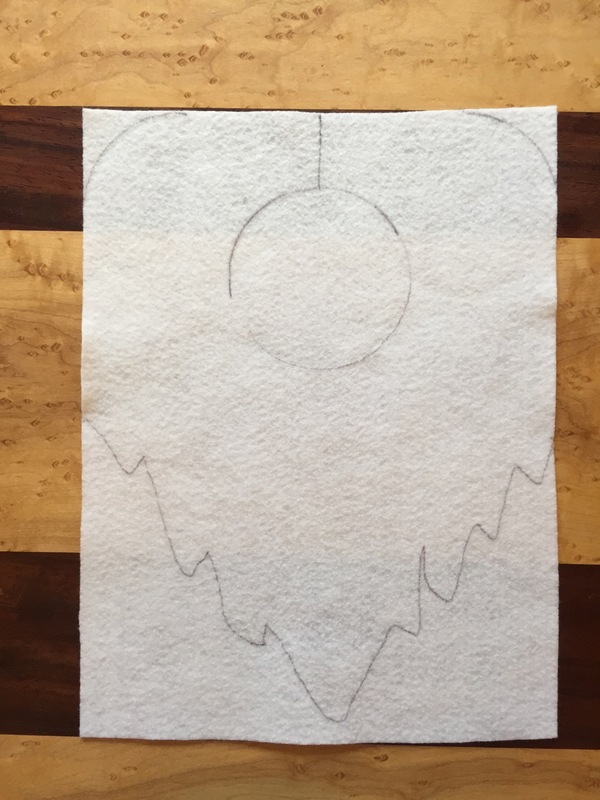 Trace a circle for the neck hole. 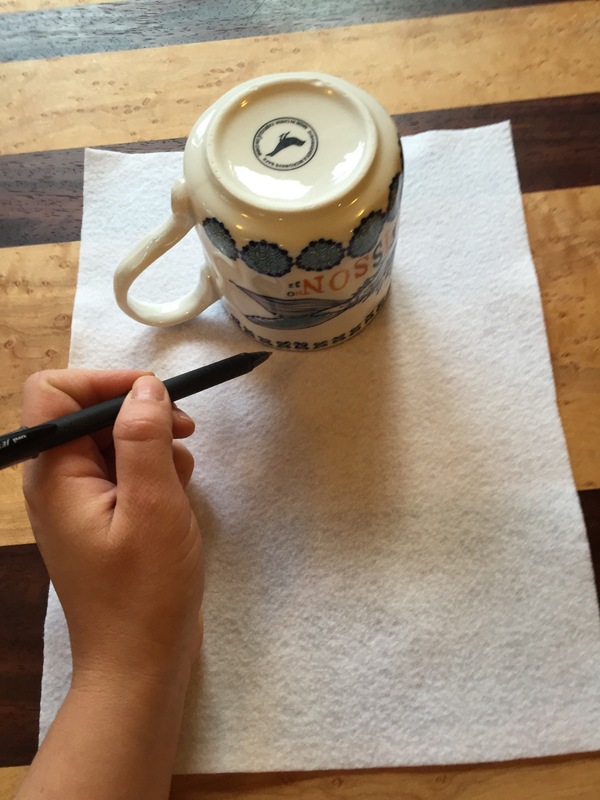 Use the mug to shape the corners of the beard bib. Freehand the shape of the beard. 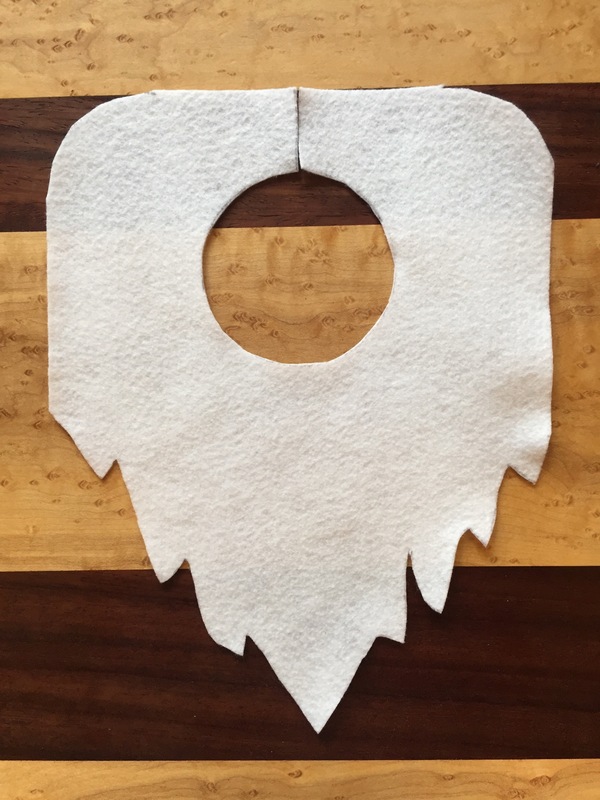 Cut out your beard bib. Dress up baby of choice in the onesie, pants and booties. Use a safety pin to connect the back edges of the beard bib. Place pointy hat atop baby. 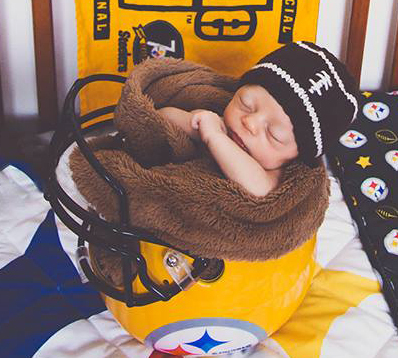 My friend Laura asked me to make her new little one a tiny football hat. I was definitely up to the challenge. I was surprised how few knitted patterns there were floating around Pinterest. Most of the patterns are crochet, which can be made very quickly, but for a football hat I think knit has more room for detail. This hat is so cute and teeny! 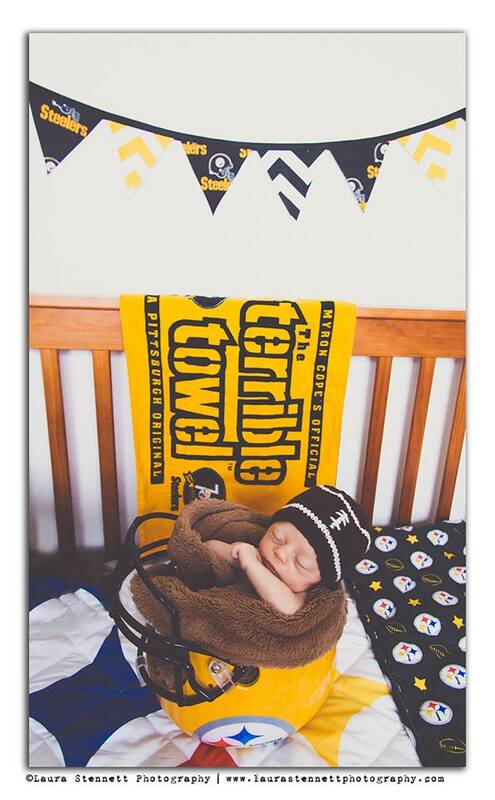 It’s based on a tiny Steelers hat I made Laura’s second child a couple of years ago. With your double pointed needles, cast on 56 stitches (14 stitches per needle) in brown. Join your work, being sure the stitches aren’t twisted and k1, p1 rib for three rounds. *K2tog*, repeat * till end of round. Cut yarn leaving an 8-inch tail. Using a darning needle, weave in all ends. For the football stitches, thread a darning needle with a 24-inch length of white yarn. On the front of the hat, whipstitch the vertical line using short diagonal stitches stacked on top of one another. Then run three wide stitches perpendicular to the vertical line. Tie off the yarn and weave in the end. 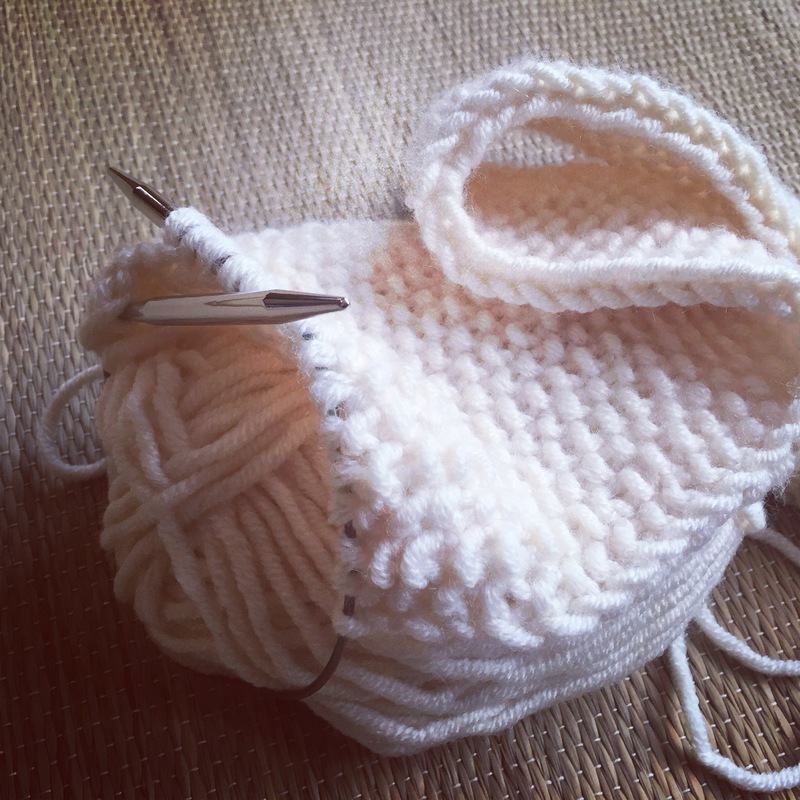 To make this hat for a newborn-3 month size, cast on 64 stitches and follow the same pattern. I’m getting down to the knitty gritty here for Christmas presents. I just had one more hat on my list and that was for my best friend’s new baby. 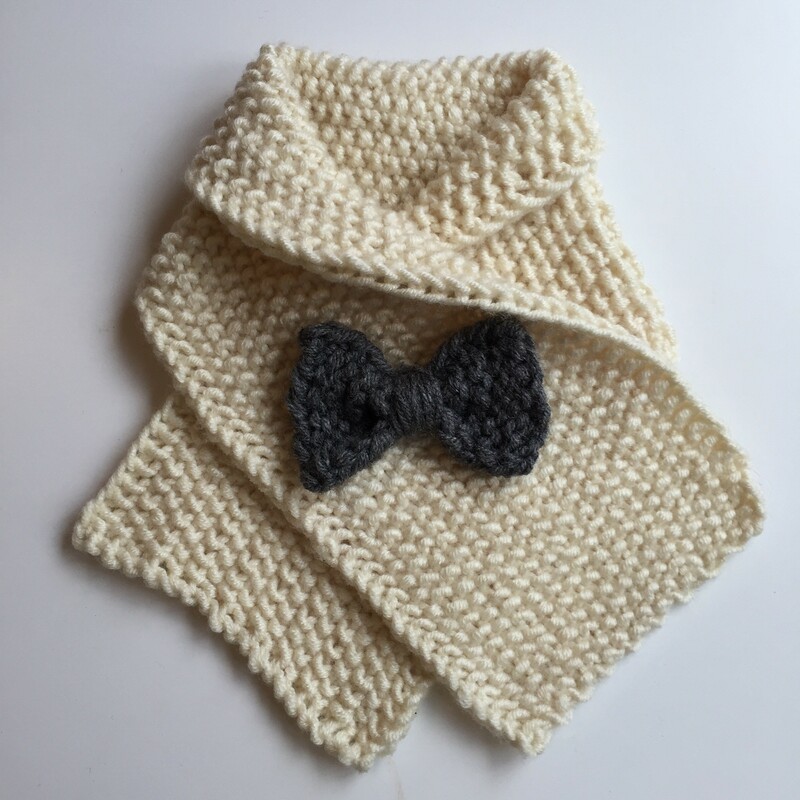 I knit this up in just a couple of hours — and you can too with this simple pattern. With your circular, cast on 64 stitches with mustard color and knit last stitch to first stitch without twisting the stitches. K1, P1 for six rounds. Knit 8 rounds in stockinette stitch. Switch to teal and knit three rounds. Do not cut mustard yarn. Cut teal yarn with an 8-inch tail. Switch to mustard yarn and knit two rounds. Switch to light blue and knit two rounds. Do not cut mustard yarn. 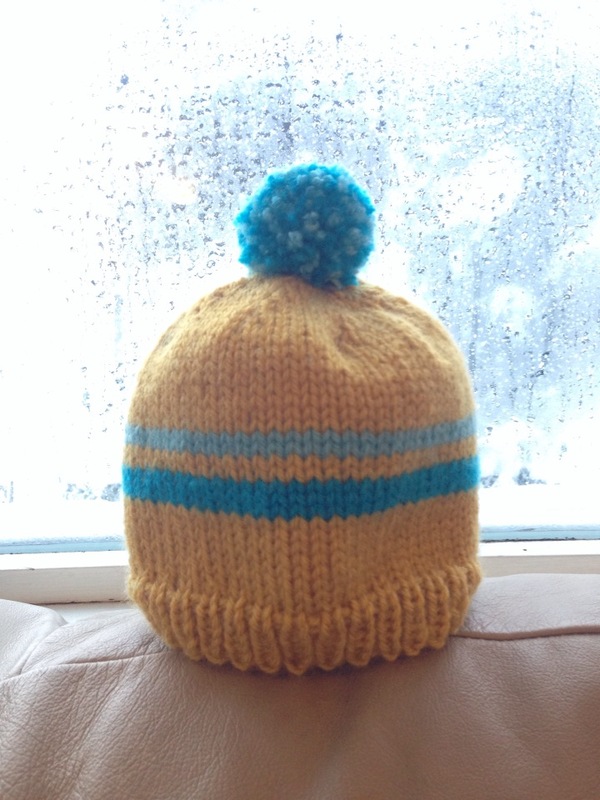 Cut light blue yarn with an 8-inch tail and knit 10 rounds with mustard. Place a marker if you need to, but I can tell where the beginning of the round is based on the stripes. K one round while transferring to double pointed needles. Or knit the round and transfer stitches — whatever’s easier for you. Cut yarn leaving a long tail. With darning needle, draw up remaining stitches and weave in all ends. Take both the teal and light blue yarn and wrap them around a large serving fork till it’s pom pom sized. With a doubled piece of yarn about one foot long, tie the yarn around the middle tine and remove from the fork. Cut the loops and trim pom pom to your liking. Using a darning needle, attach to top of hat. To better secure pom pom, run the yarn back up through the pom pom and back down into the inside of the hat.